Please continue to pray for the Rowe's. Baby Reese went to be with Jesus last night. Please join me in praying for their sweet family. Today hasn't been overly exciting. Bubby and I went over to mom and dad's house for awhile and then came home. B's been VERY cranky today. Maybe he's finally getting teeth?! Ha. I think tomorrow we are going to go bowling with B. We'll give the chest carrier a shot and take the stroller for backup! 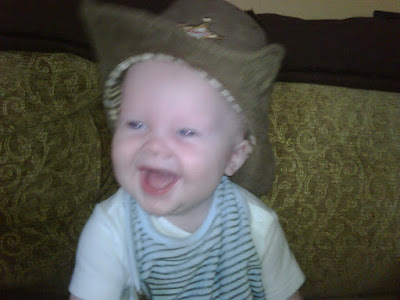 Awe my niece bought that same cowboy hat for my grandson and it is just adorable! He will have his picture made in it today! Brayden sure has grown and is so handsome. Hoping God is giving them some sort of peace as they are dealing with their loss.